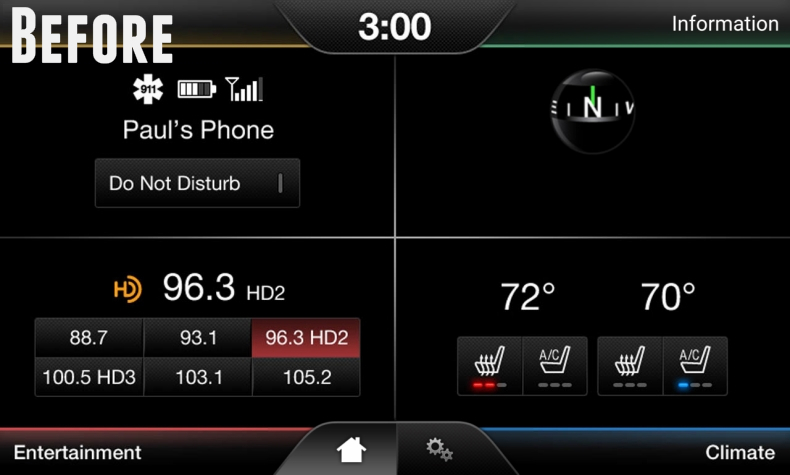 † The 2011 and 2012 Edge will not display the source "Bluetooth Audio" in the instrument cluster (All other sources will still display in the cluster). Bluetooth Audio will still show as a source on the main screen. 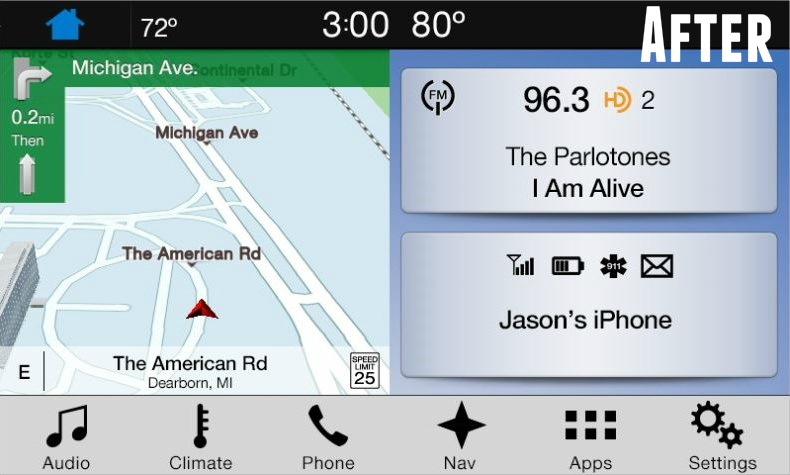 When selected, Bluetooth audio will still Artist, Title and Track information in the cluster. The only loss is the ability to select "Bluetooth Audio" from the cluster. This cravat is only found in SYNC 3 software versions 3.0 and higher. Downgrading to version 2.3 will return this functionality. NIce Upgrade from stock Sync 2 which died, black screen of death. The new Sync 3 was an easy install and works so much better than Sync 2! The Sync 3 works very good with my Iphone 6. It is much faster unit than the 2.
are driving and show you 250+ feet off from your road. The work around is to go to Google Maps and run it instead and then the GPS seems to get back on track. I then switch back to Waze. This only happens maybe one out of every 40 times. Otherwise it is a MUST BUY Upgrade to your Ford Edge!! Have been P-O’d with the state of my Sync 2 for years. Inconsistent behavior from the interface, random reboots, and the fact that Ford treats this like the cousin in the family that no one talks about (last update to their crap was years ago now). I finally have a modern, usable infotainment system and I don’t have to buy a new car or a ‘somewhat compatible ‘ aftermarket solution to acheive it. I installed this in my 2011 Ford Edge. It was pricy especially with duties and tarrifs crossing the border from the US into Canada, but I knew it was going to be and still love it. I can't see any way to add this comment on the Ford website for sync nor the play store. But apps I actually want to use that would otherwise be compatible in the US (e.g. "Ford+Alexa") took me forever to find out are not compatible on my phone. When trying to force it with the wishlist addition, it claims the app is not compatible in my country. This is probably a Ford or Amazon limitation. I've got a major beef with Amazon for hosing Canadians on Alexa skills, but it is listed as ford's app. For this reason, beware Canadians (and I presume other second class countries). This is not a failing of 4D tech. If you don't care about the apps or you're a US citizen, you'd probably have rated this 5 stars, but no where are these limitations declared and it's frustrating to have paid more than a US citizen and be left with less. I do want to say, kudo's to 4D tech on the really easy to follow videos and so far I'm otherwise quite happy with the setup. I was super worried I was going to break something when doing the trim removal, but I followed the videos live in my car from my tablet/laptop and loved it when up and running. Didn't take too long and I didn't break anything. Hope this review helps. Sorry I can't have left an extra star. 4D tech, since I can't warn Canadians and Ford doesn't either, could you consider adding some disclaimer/hints/forums/whatever for those of us outside the US to know what we will and won't get? Not your fault, Ford and Amazon are the problems here. 4DTech was great at answering my questions before I ordered. When I was ready (and emotionally prepared to open my wallet), I ordered a Sync 3 upgrade for my 2014 Ford Edge that came with MyFord Touch with Sync (Sync 2). Kit arrived in just a couple days, and installation took less than 30 minutes. Worked right out of the gate. All items were in great shape, especially the screen. Packaging was solid. The Ford dealer told me this swap could not be done. Undoubtedly, they have not heard of 4Dtech! I did this install myself, taking my time in about an hour and a half. The install looks professional and works perfectly. The videos provided made this a no brainer. I highly recommend 4Dtech for this upgrade! Waze is here. This is needed. I installed in 2011 Ford Edge. Couple of things. In the video, they made it seem easy to remove the trim, and separate the top and bottom panels. I found IT IS NOT. I had the trim removal tool but at times it felt I was going to snap something. Don’t be afraid to give it a little force, but be careful. The rest went pretty smooth. Once Up and running, to use Applink and Waze, I had to DISABLE CarPlay. Not a big deal, but wasn’t clear. You also have to pair the phone with Bluetooth, and plug in USB and make sure you have latest update of Waze. Overall very happy. This is an awesome product and I highly recommend it to anyone wanting to upgrade their Sync system and adding Apple car play. Before installing this product, the Sync system was basically out of Sync. After installation flawless switching between iPhone, radio, car play, Sync etc. I gave 4 stars because of the price, although worth it! Android Auto integration is pretty cool too! One tip for the 2011 Edge: The main bezel and console (where the shifter is) separate from each other with the same kind of clips that hold the silver side trim.